Van Gogh's Oranje Vodka was the first flavored vodka I tried during my early years of bartending. I was enticed by the beautiful bottle and sold on the subtle essence of citrus. Drinking it chilled with a squeeze of orange is so delicious and simple that it should be a staple in every home bar for those last minute entertaining needs. If you are in the mood for something more decadent, Van Gogh Vodka has some fantastic cocktail recipes to satisfy your sweet tooth. Try this one to cool down on a sweltering summer afternoon or serve it to your guests as a childhood dessert with a grownup twist. It was created by top mixologist Jonathan Pogash. 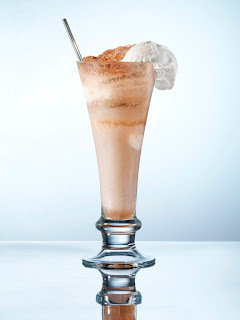 Add the vodka directly to a tall glass, then top with root beer, and lastly the ice cream (add slowly, as it has a tendency to overflow). Garnish with a milkshake straw and enjoy! For those of you watching your waistline, there is an easy low-cal version. Just trade in fat-free ice cream and diet root beer!